We at Clio Computers take pride in our service to others. We love our work and our community. 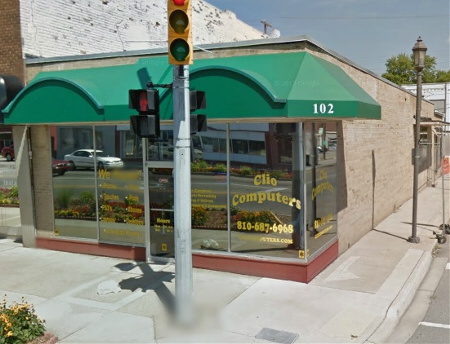 We live and work here in Clio and take pride in earning your trust. We go above and beyond what is called for the job. We have the trust from the local churches, city offices of Clio, we help with the Red Cross, the Clio Human Services fund and more. We are fully certified, insured and LOVE OUR WORK! We think you shouldn't have to hassle with the problems of owning a computer with a problem and will try to help and explain things to you in your language, not geek language. If you don't ask, you can't complain. Competition from the big companies is fierce! But our systems are assembled right here in Clio, MI - NOT in Taiwan or China and shipped to a factory in Los Angeles to wait for you to call and order one. We strive everyday to be competitive and most of the time, dollar for dollar for what you get we can meet or beat those companies!! Do you really want to talk to India for service? home entertainment systems with Blu-Ray included. We also offer a business type system for high end computing with loads of RAM. Below is a chart of systems available to purchase or we can build a custom computer with your specs. If you don't see something that you want, call us today for a quote!